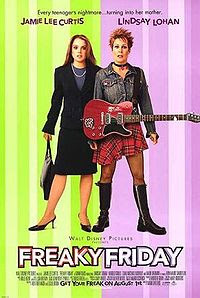 Freaky Friday (also known as Fortune Cookie in Japan) is a 2003 film based on the novel of the same name by Mary Rodgers. It stars Lindsay Lohan as Anna Coleman and Jamie Lee Curtis as her mother. In the film their bodies are switched due to an enchanted Chinese fortune cookie. Lindsay Lohan was still doing good in hollywood at this time but now she is totally messed up. I like all her movies before and watch almost all of them. Now, she can't get a good movie offer and is facing a 90 days in jail. Anyhow, this week edition for Tuesday Couch Potatoes is all about Best Chick Flicks and Freaky Friday is my pick. An overworked mother and her daughter do not get along. When they switch bodies, each is forced to adapt to the others life for one freaky friday. Watch the trailer on youtube, im sure you will enjoy the movie. i really enjoyed this film. Jamie Lee Curtis was SUPERB! My kids and I love it and we still watch it on weekends, lol! nice pic!